A PET show has become a popular feature of Maybole Gala festivities, and this year's event was no exception. Top canine trio, with their owners. Photos of prize winning pets. 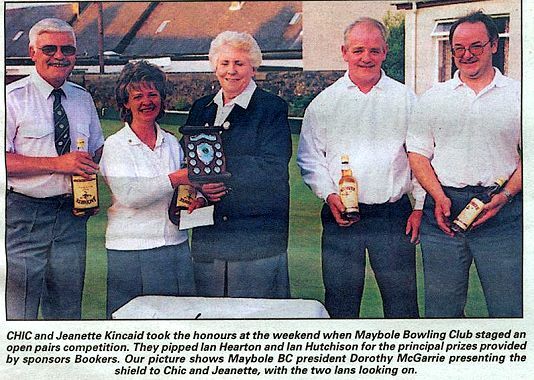 CHIC and Jeanette Kincaid took the hounours at the weekend when Maybole Bowling Club staged an open pairs competition. 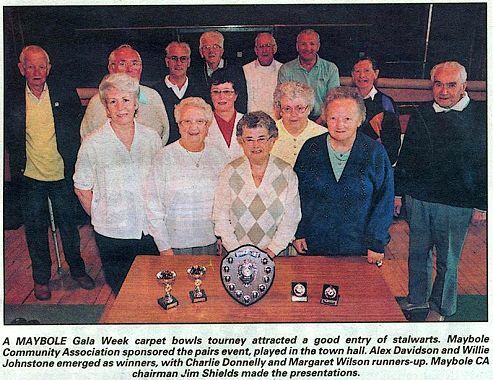 A Maybole Gala Week carpet bowls tourney attracted a good entry of stalwarts. Honoured...Provost Liz Foulkes presented mementos to Janetta Rodger and David Hunter. 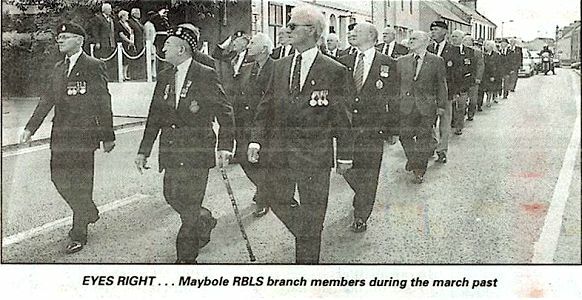 Eyes Right....Maybole RBLS branch members during the march past. Colour Party ... standard bearers form up to take part in the impressive parade. 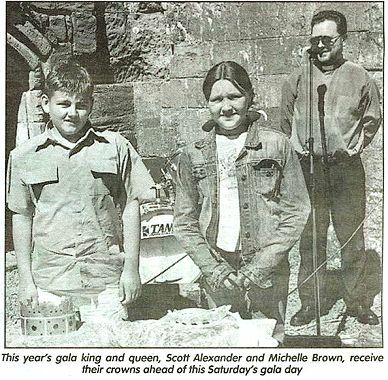 Merriment is what gala days are all about, as the good people of Barr and Maybole showed on Saturday. 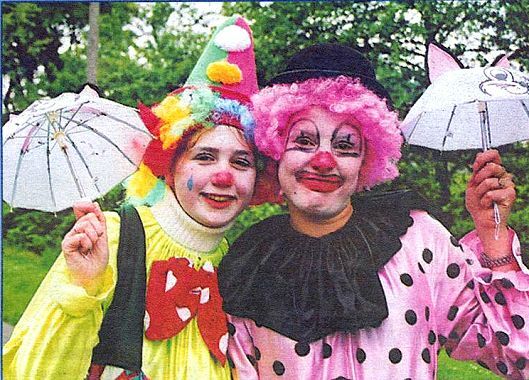 Waitress Lorna Porter (left) and barmaid Tracy Wright of the King's Arms in Barr made a jolly duo. People from all over the world are travelling to Maybole in search of their roots. Marks & Spencer vouchers worth £20 have been posted to a carer in the Maybole area who won a lucky draw. 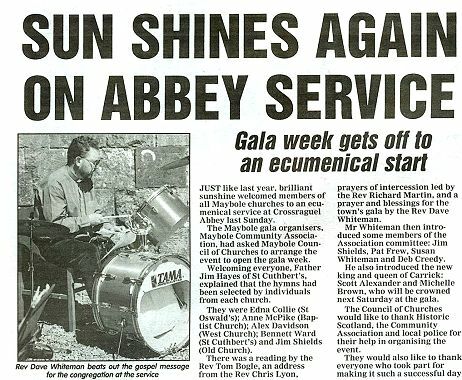 Bypass campaign in the spotlight. BBC Scotland's flagship news programme this week highlighted South Ayrshire Council's campaign for a Maybole bypass. 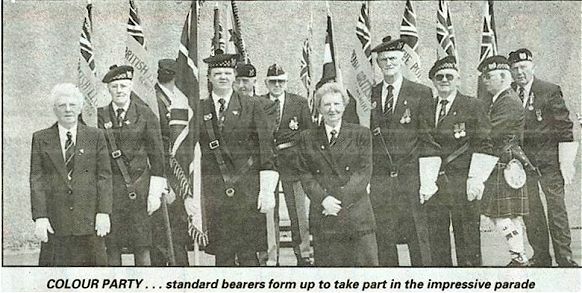 And the 'Reporting Scotland' bulletin revealed that council leader, Councillor Andy Hill, will meet Scottish transport and planning minister Sarah Boyack. 25 YEARS AGO: Bypasses for Girvan and Maybole are high on Kyle and Carrick District Council's list of priorities. When it comes to a wedding with a difference, here's a Maybole bride who's definitely at the races! Or definitely at the racecourse, to be more precise, as that's where Gwendolyn Cooper's reception was held. 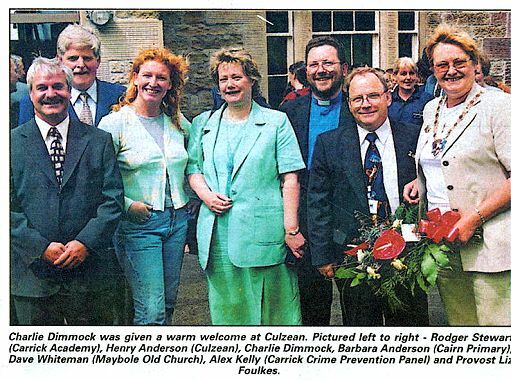 Charlie Dimmock was given a warm welcome at Culzean. 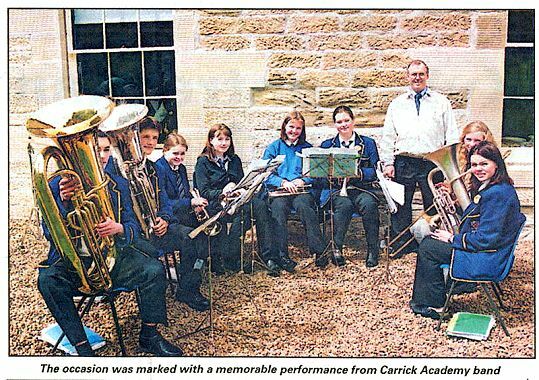 The occasion was marked with a memorable performance from Carrick Academy band. Tv's Ground Force gardener and Chelsea Flower Show presenter Charlie Dimmock has formally opened the newly restored Vinery and Dolphin House at Culzean Castle. 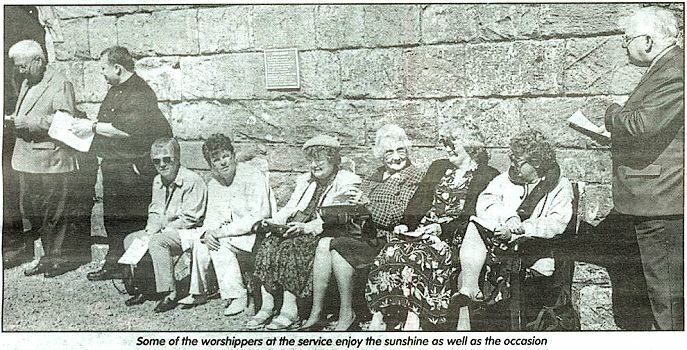 Some of the worshippers at the service enjoy the sunshine as well as the occasion. 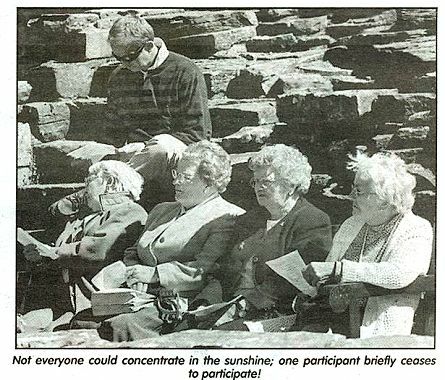 Not everyone could concentrate in the sunshine; one participant briefly ceases to participate! 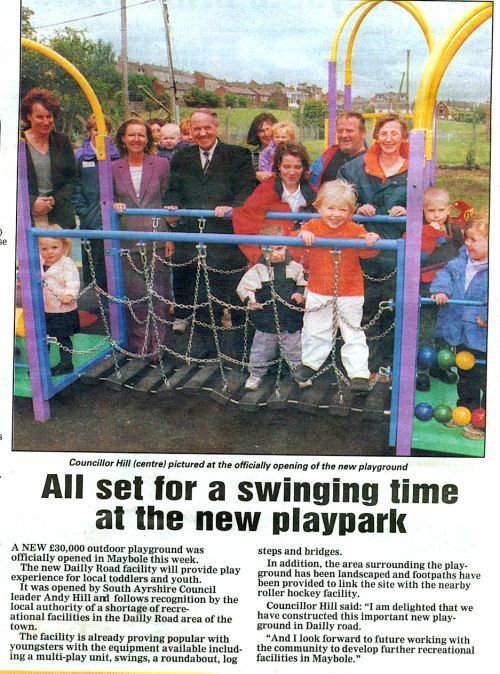 All set for a swinging time at the new playpark. A new £30,000 outdoor playground was officially opened in Maybole this week. Jean McGill was elected to Maybole Community Council last week. Melodies with the concert party. Maybole Concert Party will be in the Town Hall this Friday, June 15, with 'Midsummer Melodies'.